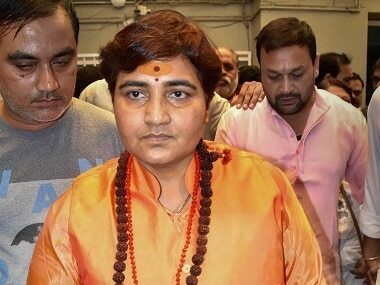 A credible face to lead its campaign, a semblance of unity among the many factions of the perennially divided party and whirlwind tour by party vice-president Rahul Gandhi across the state to canvass for votes for party candidates - nothing seems to be helping the Congress’ cause in the Madhya Pradesh assembly elections. 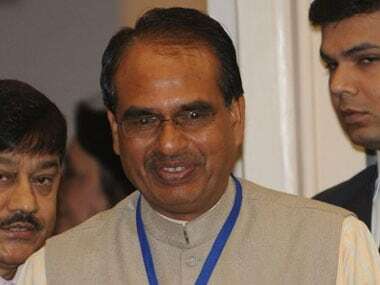 The meticulously drawn corruption charges against Chief Minister Shivraj Chouhan are also falling flat. People might be unhappy with the BJP government in the state for different reasons, but they still think Congress is the greater evil. The party’s decade-long wait to recapture power in Madhya Pradesh looks set to prolong. If Rahul Gandhi was looking for a revival of the Congress fortune in the current round of assembly elections, he should stop counting in Madhya Pradesh. According to a CNN-IBN survey conducted by Delhi-based research organisation CSDS and Lokniti, the BJP is likely to register a six percent rise in vote share compared to 2008. In the previous assembly election, the party had secured a vote share of 37.6 percent; it goes up to 44 percent. The Congress’ vote share increases marginally from 32.4 percent to 33 percent but that is hardly enough to topple the BJP. 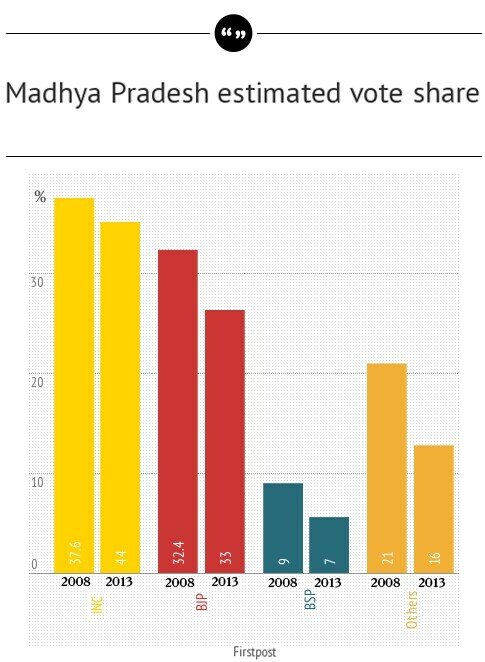 Estimated voteshare in Madhya Pradesh. It means a pre-incumbency wave is sweeping the central Indian state. The allegation of corruption against the Shivraj government has not stuck and factionalism within the state unit of the BJP may not be as damaging to the party’s prospect as it appears from outside. In terms of seats, which is a tricky proposition since increase in vote share does not necessarily translate into more seats, the BJP looks comfortably set to form the next government. 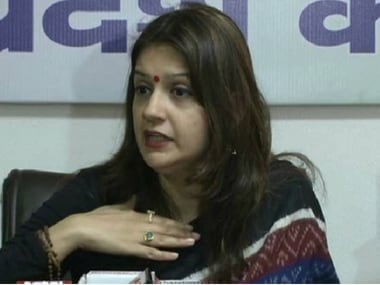 The ruling party, according to the projection of the survey, is likely to bag between 148 and 160 seats in the 230-member house compared to 52-62 of the Congress. In the 2008 elections, the BJP had won 143 and the Congress 72. The survey, conducted between October 13 and October 20, involved a sample size of 2,870 spread across 140 polling stations in 35 assembly constituencies of the state. The number of respondents across categories - women, urban population, SCs, STs, Hindus and Muslims - correspond to their numbers in the 2011 Census in percentage terms. A young face with greater credibility does not necessarily mean gains in terms of young voters. 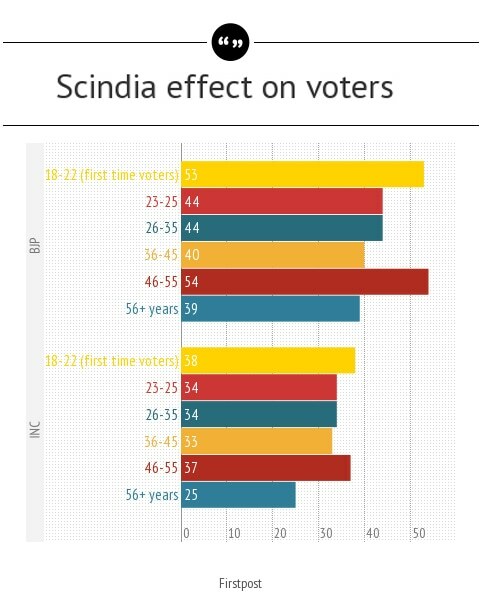 As many as 53 percent of voters in the age group 18-22, mostly first time voters, are likely to vote for the BJP. The elevation of Jyotiraditya Scindia, may have been a good move from the Congress’ perspective, but the young voters are not floored by his boyish charms and ernest approach. Thirty-eight percent would like to vote for the Congress. In the age group 23-25, the BJP looks to be the gainer again with 44 percent of respondents backing it compared to 34 percent of the main rival. In the age group 36-45, it is a repeat of the numbers. In fact, across all age groups, the BJP is the favourite. What voters have to say about Jyotiraditya Scindia. Jyotiraditya has a big burden to shoulder. The Congress in Madhya Pradesh is still identified with Digvijaya Singh and his hugely unpopular government before 2003. It would take some time for any other party leader to undo the damage. And Digvijaya is still around as an important public face of the party. That certainly is a cross the young leader has to carry. As the choice for chief ministerial candidate he does not fare too poorly, with 33 percent of respondents backing him, compared to 44 percent of Shivraj Chouhan. Interestingly, the latter is more popular among women compared to men. While 47 percent of women respondents preferred Shivraj, only 28 liked Jyotiraditya. Digvijaya’s rating as the choice for the top job is pretty low with only 3 percent backing him. Interestingly, a large number of Congress voters rate Shivraj’s two terms as chief minister much higher than Digvijaya 10-year stint before 2003. As many as 28 percent of traditional party voters said the former has been better as chief minister. Almost the equal number said the latter was better but coming from Congress voters the numbers are notable. It appears the Congress was too late in bringing Jyotiraditya into the picture. Also Shivraj has been a far better chief minister and leader than his critics would believe.